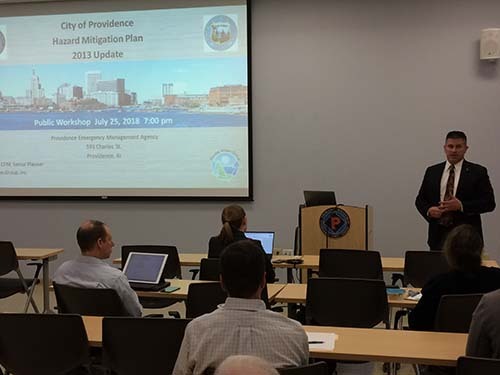 Residents of Providence joined Providence Emergency Management Agency staff on July 25, 2018, for the first public workshop for the 2018 Multi-Hazard Mitigation Plan Update. As part of the workshop, residents of the community discussed areas of the city vulnerable to flooding during heavy rainstorms and marked areas of concern on maps. 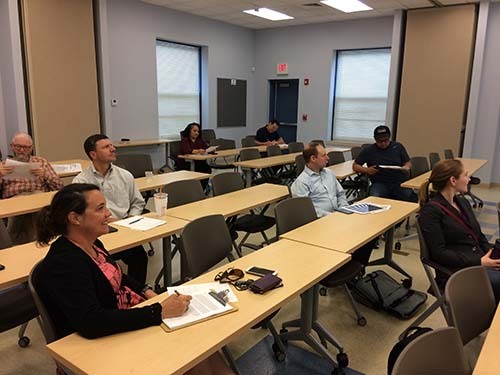 Community participation and input is an essential part of the hazard mitigation planning process and two additional public workshops will be scheduled in Fall 2018. Mitigation is the effort to reduce the loss of life and property by lessening the impact of disasters. Mitigation is taking action now–before the next disaster–to reduce human and financial consequences later (analyzing risk, reducing risk, ensuring against risk). Effective mitigation requires that we all understand local risks, address the hard choices, and invest in long-term community well-being. Without mitigation actions, we jeopardize our safety, financial security, and self-reliance. Hazard mitigation planning is a key way to identify mitigation actions that can help communities improve their resilience to future disasters and reduce their risks of impacts. In order to remain eligible for pre-disaster grants and p ost-disaster funding, the City must update the Multi-Hazard Mitigation Plan every five years. 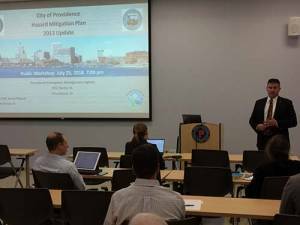 The City of Providence is currently engaged in the 2018 Multi-Hazard Mitigation Plan update process and will submit the updated plan to Rhode Island Emergency Management Agency for review in spring 2019. Local knowledge is critical to the success of a hazard mitigation plan. As part of the current plan update process, we are asking residents and business owners to provide insight into location-specific information related to impacts from natural hazards. It’s easy, just click on the links below to access our quick surveys! Select the hazard category (winter-related, flood-related, etc. ), then the hazard type (snow, riverine flooding, etc.). Next, scale the map to adjust the point above the general location, add your description, and insert a photo (jpeg please) if available (please make sure to complete the ‘photo credit section’ if we can use your image in our work). Thank you for participating in the hazard mitigation planning process! As part of the Hazard Mitigation Plan Update process, the City would like to know your thoughts on vulnerabilities and preparedness. Please take a few minutes to complete the survey. All responses are anonymous.